I admit I’m including a fairly marginal strip in this, just so I can have the fun of another single-day edition. What can I say? I can be easily swayed by silly things. Also, somehow, all four strips today have circumstances where one might mistake them for reruns. Let’s watch. 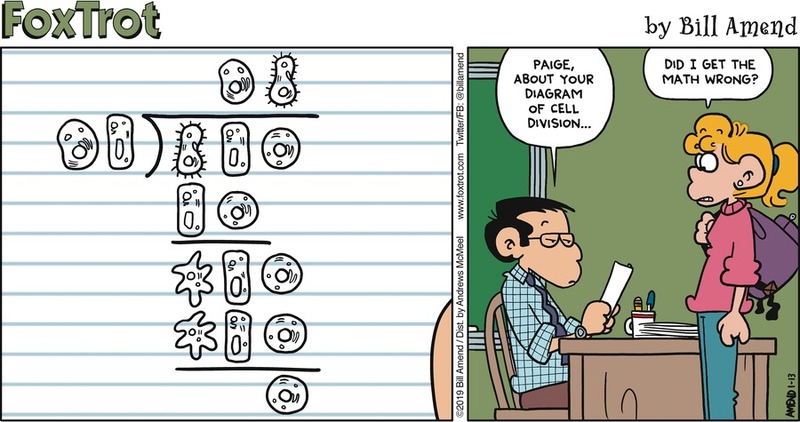 Bill Amend’s FoxTrot for the 13th is wordplay, mashing up ‘cell division’ with ‘long division’. As you might expect from Bill Amend — who loves sneaking legitimate mathematics and physics in where it’s not needed — Paige’s long cell division is a legitimate one. If you’d like a bit of recreational mathematics fun, you can figure out which microscopic organisms correspond to which numerals. The answer is also the Featured Comment on the page, at least as I write this. So if you need an answer, or you want to avoid having the answer spoiled, know what’s there. Bill Amend’s FoxTrot for the 13th of January, 2019. Essays discussing topics raised by FoxTrot , whether new (Sunday strips) or rerun (the weekdays), should be at this link. Greg Evans’s Luann Againn for the 13th is the strip of most marginal relevance here. Part of Luann’s awful ay is a mathematics test. The given problems are nothing particularly meaningful. There is the sequence ‘mc2’ in the problem, although written as . There’s also a mention of ‘googleplex’, which when the strip was first published in 1991 was nothing more than a misspelling of the quite large number. (‘Googol’ is the number; ‘Google’ a curious misspelling. Or perhaps a reversion. The name was coined in 1938 by Milton Sirotta. Sirotta was seven years old at the time. I accept that it is at least possible Sirotta was thinking of the then-very-popular serial-comic strip Barney Google , and that his uncle Edward Kasner, who brought the name to mathematics, wrote it down wrong.) And that carries with it the connotation that big numbers are harder than small numbers. This is … kind of true. At least, long numbers are more tedious than short numbers. But you don’t really do different work, dividing 1428 by 7, than you do dividing 147 by 7. It’s just longer. “Hard” is a flexible idea. 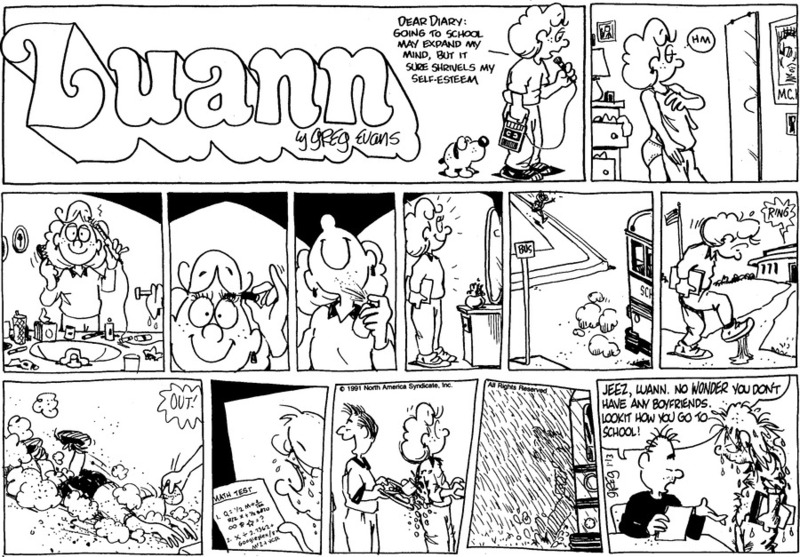 Greg Evans’s Luann Againn for the 13th of January, 2019. It originally ran the 13th of January, 1991. Essays discussing topics raised by Luann , whether new (current day) or rerun (1991 vintage), should be at this link. Mac King and Bill King’s Magic in a Minute for the 13th felt like a rerun to me. It took a bit of work to find, but yeah, it was. The strip itself, as presented, is new. But the same neat little modular-arithmetic coincidence was used the 31st of July, 2016. Mac King and Bill King’s Magic in a Minute for the 13th of January, 2019. Essays discussing topics raised by Magic In A Minute , whether new or re-drawn magic, should be at this link. Mathematics on clock faces is often used as a way to introduce modular arithmetic, a variation on arithmetic with only finitely many integers. 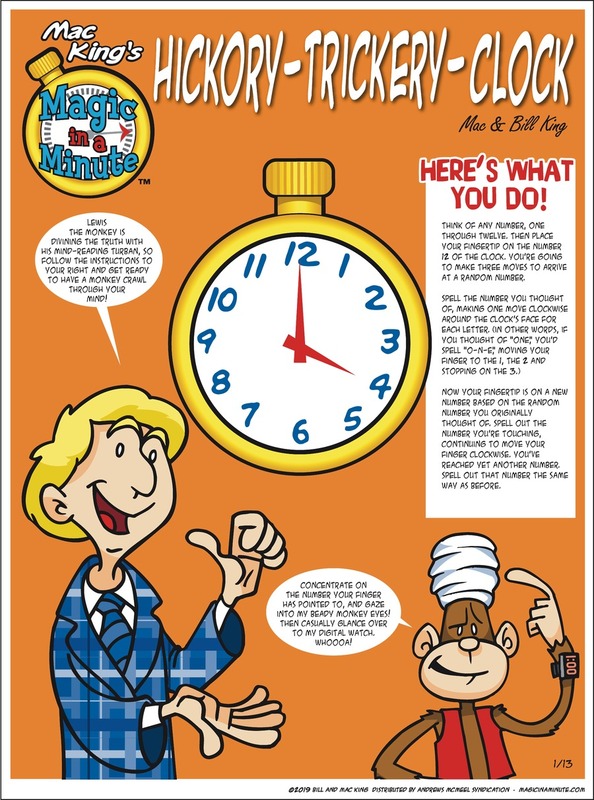 This can help, if you’re familiar with clock faces. Like regular arithmetic, modular arithmetic can form a group and a ring. Clock faces won’t give you a group or ring, not unless you replace the number before ‘1’ with a ‘0’. To be a group, you need a collection of items, and a binary operation on the items. This operation we often think of as either addition or multiplication, depending on what makes sense for the problem. To be a ring, you need two binary operations, which interact by a distributive law. So the operations are often matched to addition and multiplication. Modular arithmetic is fun, yes. It’s also useful, not just as a way to do something like arithmetic that’s different. Many schemes for setting up checksums, quick and easy tests against data entry errors, rely on modular arithmetic on the data. And many schemes for generating ‘random’ numbers are built on finding multiplicative inverses in modular arithmetic. This isn’t truly random, of course. But you can look at a string of digits and not see any clear patterns. This is often as close to random as you need. Rick DeTorie’s One Big Happy for the 13th of January, 2019. Essays discussing topics raised by One Big Happy , whether new (on Creators.com) or rerun (on GoComics.com), should be at this link. Rick DeTorie’s One Big Happy for the 13th is mostly a bunch of complaints the old always have against the young. Well, the complaint about parallel parking I haven’t seen before. But the rest are common enough. Featured in it is a complaint that the young can’t do arithmetic. I’m not sure there was ever a time that the older generation thought the young were well-trained in arithmetic. Nor that there was ever a time that the current educational vogue wasn’t blamed for destroying a generation’s ability to calculate. I’m sure there are better and worse ways to teach calculation. But I suspect any teaching method will fall short of addressing a couple issues. One is that people over-rate their own competence and under-rate other’s competence. So the older generation will see itself as having got the best possible arithmetic education and anything that’s different is a falling away. And another is that people get worse at stuff they don’t think is enjoyable or don’t have to do a lot. If you haven’t got a use for the fact, or an appreciation for the beauty in it, three times six is a bit of trivia, and not one that inspires much conversation when shared. There’s more comics with something of a mathematical theme that got published last week. When I get to them the essays should be at this link.